Urbanest Faux Leather Mini Chandelier Lamp Shades Set of 6 Bell Softback 3x6"x5"
6" White ROUND ACRYLIC PLASTIC FIXTURE LIGHT GLOBE 3” fitter neck. Condition is New. Shipped with USPS Priority Mail. Ships free to the 48 states. Contact us for shipping beyond. Available with a ceiling mount fixture option with a medium base socket. Screw neck style available as well. Contact us for volume discounts. Made to mount with a 2-1/4" shade fitter. Heavy duty, industrial, gorgeous, these are the real deal. You can't go wrong.TY. The 2.0 Flex was re- designed to accommodate a wider range of short shell lengths, should Aguila ever want to make an even shorter (or longer) Minishell. The 2.0 Flex will feed all but the longest in their line, the 3 Buck. Evelots Ceiling Clip-on Light Bulb Shade-Lamp-Dome-Diamond Cut-Acrylic-Set/2. Accent a casual or refined table lamp design with this round drum lamp shade from Springcrest Collection™. Designed with soft texturing, the shade features a polystyrene exterior in a beautiful blue finish. 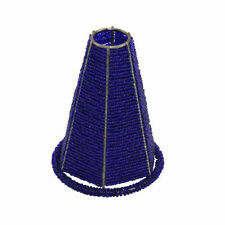 Linen Drum Chandelier Shade Spa Blue. For sale is white with black trim clip on lamp shades. These shade are 8" tall, 12x8" wide on the bottom and 8 x 6 3/4" on the top, tapered oval shape. These all have a very light indent on the long side that you can see in pictures. It is noticeable but barely, especially when the light is on. In some of the pictures you will see it wrapped in plastic. This is because these are brand new. The shades you receive will come wrapped as shown. Please look at all the pictures as to this is exactly what you will be receiving. Please ask me any questions and thank you for viewing. 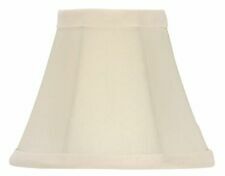 Set of 2 White Linen Drum Lamp Shade 10x12x8 (Spider). 1/2" drop. Includes a 7" high harp. The correct size harp and a finial are included free with this shade. The white linen of these hardback drum shades have a classic appeal. Specification：Material: cloth fabrics and IronMain application: pendant lamp, wall lampApplicable lamp holder: pointed bulbSize: 80x130x120cm/ 3.1x5.5x4.7in (top open diameter x bottom open diameter x height)Why do we need a lampshade?Lampshade effectively realize spot light effect to create a romantic and warm atmosphere with no dazzling. Especially for families with children, too bright light will do harm to baby's eyes. Besides, once the lamp equipped with lampshade, it will definitely highlights the high-end and elegant taste.Tips: this is a small lampshade for clip-on bulbs, applies to pointed bulbs with any lamp basePackage included:6 x Fabrics Lampshades Brand Fuloon MPN DL-LCZD01-YE UPC 889491. Faux leather rustic lamp shade that are laced top and bottom. It has clip-on that attaches to candelabra-shaped light bulb with standard. From Springcrest Collection™, the shade boasts a clean, crisp silhouette with a touch of an aged look in its multi-tonal coloration. The correct size harp and a finial are included free with this shade. From the Victorian Trading Co Chantilly Lace Ivory Drum Lampshade. 12" TALL X 16" WIDE. Easily update your chandelier shade. Dark purple satin shade. From the Brentwood Collection™. Silver gray trim and liner. 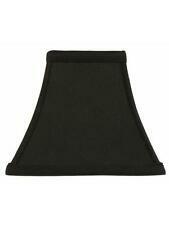 The correct size harp and a finial are included free with this shade. 14" across the top x 16" across the bottom x 11" on the slant x 11" high. Size: L8.85 W5.3 / Length approx.22.5 cm,width 13.5 cm, depth 6 cm. Size: L8.85 W5.3. Note: Unplug the lamp socket. Carefully unscrew light bulb holder and unscrew light flex and then unscrew both ends of arms. The color of this shade is is Off-White, and is pleated. This shade has a washer center and is designed to fit on an 8" harp. 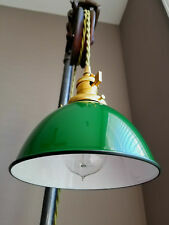 Faux oiled kraft laced lamp shade with lacing top and bottom with built-in clip-on that attaches to standard bulb. This has wrap-around scene of a BEAR that is intensified when lit. We have 6 different scenes: cowboy, bear, deer, fish, moose, and coyote (or wolf). The correct size harp and a finial are included free with this shade. 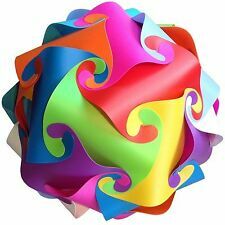 Colorful cotton blend fabric drum shade with a tropical flower and leaf pattern. Ceiling Fans. 14" across the top x 16" across the bottom x 11" on the slant. Rustic Appearance Burlap. (No, the bottle lamp is not included). It has the wire bulb clip which fits standard sized light bulbs. Tapered Traditional Cone Style. Premium Table Lamp Light Bulb Lamp Shade. Waverly Toile Chandelier Shades Set Of 2 Cream And Blue. Condition is New. Shipped with USPS Priority Mail. Measurements are 5inches tall 6 inches wide on bottom and 3 inches wide on top. White fabric liner inside with a polished brass finish spider fitting. Red fabric bell lamp shade with self trim top and bottom. The correct size harp and a finial are included free with this shade. 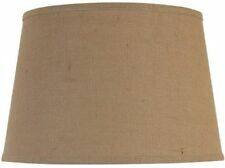 Upgradelights White English Barrel 6 Inch Linen Chandelier Shades 3.5 inches across the top 6 inches across the bottom and have a side slant of 4.55 inches. 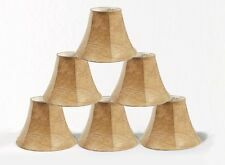 Drum white linen shade Rolled edge Hardback natural linen shade whiteFitter: FLAME CLIP (FC) Fitter designed to fit over a Candelabra bulb base. (Most clip-on lampshadesare designed with a flame clip) Suggested maximum wattage is 60-watt candelabra bulb. Brass frame that is also rust resistant. Lining is white. This small drum shade features a deep, cylinder shape. White cotton material features a rolled edge. The correct size harp is included free with this shade. The correct size harp and a finial are included free with this shade. From the Victorian Trading Co Embroidered Velvet Lampshade Countless threads create a classical flower urn upon crushed velvet. Alternate knotted chiffon panels permit diffused light to permeate the room. Imported. 16" dia, 14" tall. Requires harp fitter. Lamp base sold separately. New ListingL.A. Galaxy Lamp Shade. MLS. Soccer. Los Angeles Galaxy Lamp Shade. Perfect size for a small table lamp. The shade is 7" tall, 9.5" wide at the bottom and 5" wide at the top. It has an UNO attachment that sits on the socket before the bulb is inserted. Shipped with USPS Priority Mail. Ergonomically designed to project optimal light. Size is ideal for any chandelier, small candle lamp, or wall sconce. Westinghouse 81356 Tortoise Glass Bell Lighting Fixture Glass Shade, 2-1/4"
It's not just for sunglasses anymore. 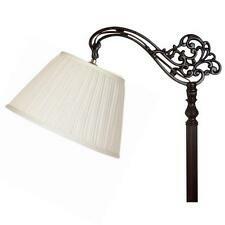 A carved ridge near the top of the shade puts a decorative twist on the classic bell shape. This shade will work with a variety of lighting fixtures--your light, your choice, your way. This globe only fits the newer style Hampton Bay ceiling fans. This globe screws into place much like a jar lid, with the glass being molded into a screw fashion at the opening. The older style Gazebo fan globes were held in place with three screws, this IS NOT THAT GLOBE! These have all the imperfections and irregularities you'd expect of burlap. Trending at $10.41eBay determines this price through a machine learned model of the product's sale prices within the last 90 days.